Green Bay Banyuwangi also called Teluk Hijau, This beach is one of interested Beach in Banyuwangi. Its name may not be as popular as Rajegwesi Beach or Sukamade turtle beach. But this Green Bay has a special attraction to the charm of soft white sand, 8 meter high waterfall and colorful coral formations. As the name implies, this beach seem colourfull when seen from afar. This is different from most of the bay or ocean that is usually blue. The green color because in the bottom of shallow waters are reflecting green algae in the surface waters. Green Bay is located in Banyuwangi, the southern part Pesanggaran, Sarongan village. Its territory is included in Meru National Park Betiri. This coast is a hidden paradise in Banyuwangi. 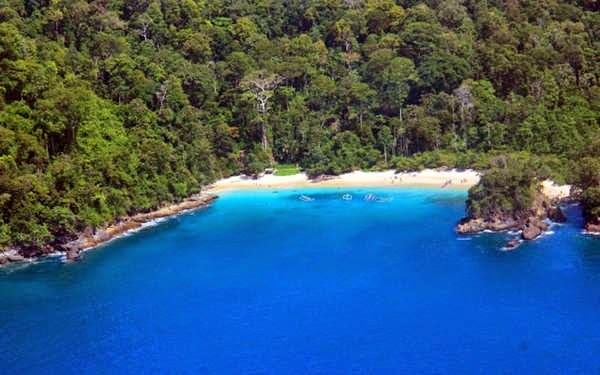 Teluk Hijau is still hidden and quiet in this charming white sand. The sand is so fine, so easily attached to the skin. A blend of white sand, clear sea water a greenish color and a beautiful atmosphere will make the visitors stay comfortly. Most foreigner and domestic tourist visit the Green Bay beach after finish enjoy the Red Island Surfing, Plengkung Surfing and Sukamade Beach tour from Banyuwangi as a primary planning. Before continue their vacation to Green Bay Beach Banyuwangi, we will go through Pantai Teluk Hijau . So that it is just became a haven. Visitors just stop for a moment and look at the exotic Green Bay in the distance on the hill. But the real paradise view is located on its shores. To achieve Teluk Hijau does require challenging struggle adrenaline. Through the path that is steep and rocky, visitors must descend the hill and through the forest with big trees. After passing through the field pretty drain stamina, you will get to the open area. Green Bay is located in Pesanggaran Sarongan District precisely in the village. Located about 90 km south of the city of Banyuwangi. While Jember distance of approximately 105 km. To reach this beach from Banyuwangi and Jember we just follow the directions to the Sukamade Beach in Merubetiri National Park, which is the direction of the route to Green Bay. The nearest route to reach Teluk Hijau is from Banyuwangi Harbor, If you think very difficult to find the main route, You can entrust your vacation to Travel Agency Banyuwangi, But If your planning will start from Surabaya City, You can find the nearest Travel Agency in Surabaya in order You can organize your holiday relaxly. Beside Green Bay Beach Banyuwangi and other interested beach, There is amazing volcano tourism that also located in Banyuwangi regency namely Blue Flame Ijen Crater, Most visitors take the Ijen Crater tour package when They need to see amazing Blue Flame inside the Ijen Crater. Green Bay is one of the interested place tobe a relax vacation, You can enjoy sunbathing along Green Bay shore. Most tourist visit this beach after visit enjoy Mount Bromo, Ijen Crater tour 3 days. because both of these volcano have amazing popularities. Such as Mount Bromo Sunrise tour that popular with its Sunrise photography and Ijen Crater tour that popular with amazing Blue Flame Crater appearance. If You are interested enjoy the beauty of Green Bay (Teluk Hijau Beach in Banyuwangi) and other nature tourism in East Java, You can read detail link itinerary below. If you need more information about all nature tourism in Banyuwangi and other places around East Java, You can visit Our booking form in order You get your request order. Our partner will serve your request with fast response and friendly.